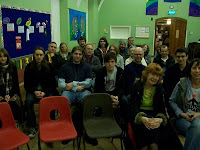 A very successful first meeting of the Maidstone Coalition of Resistance was held last night, with around 20 people. Dan opened the meeting with a wide ranging call to rally around the movement. He had been to the London conference last year and has become the interim chair for the Maidstone group. I spoke next and focussed on the economy, explaining why the country is not broke and that the rhetoric from the Conservatives and Lib Dems is based on ideology rather than fact. An ideology that ignores that our national debt was lower than it was for half of the last century and lower than many countries that are seen as stable, e.g. Germany. I went on to say that the government is using the narrative to drive the economy towards privatisation at the expense of ordinary people and public services and that the government’s attitude to bankers and corporate tax avoidance is a prime example of how they are exploiting their narrative for their own private gain. Finally I touched on where investment is needed, housing, public transport, food etc. Joan spoke last. She focussed on her post WWII experience when the country was suffering phenomenally high levels of debt yet still managed to build the NHS. The floor was then opened and I think just about everyone had a say. It was also great to see a wide range of experience and age. I think this group has legs and will build on this very good start.